Ragi, this grain is very versatile and you can dish out many tremendous dishes with it, i have been using this grain as flour, vermicelli, semolina and as whole. Thank god i get this grain very much easily in Indian stores here in Paris, i can get ragi rava, flour and whole easily in Indian provisional stores. Still ragi vermicelli is not easily available here but i dont forget to carry them or ask my relatives to send a parcel from India. Obviously my pantry is now loaded with varieties of millets,you might have noticed that most of my recent posts are with millets, yes am cooking with them atleast thrice a week and i couldnt stop myself to create different dishes with these incredible grains,one of my recent addiction. Ragi chappathi is one among the rotis i make quite often for our dinner, if there is some leftover i'll pack them carefully and freeze it for further use. Last time when i made ragi chappathis, i freezed a couple of them to make rolls with paneer or potato masala for my kids snack as they love chappathis very much at anytime of the day. Take a large bowl add both flours, add the salt and water, knead them as a soft dough..keep aside for 15 minutes. Take a small ball from the dough, dust the dough with enough maida.Roll them as chappathis..
Heat a tawa,drop the chappathi, drizzle oil and cook both sides of the parathas well until they turns slightly brown. Heat oil, fry the fennel seed powder and curry leaves, add the potato slices,cook for few minutes with enough salt. When they are half cooked, add the red chilly powder, just sprinkle some water and cook in simmer. Once the oil gets separates from the masala,put off the stove. Take the ragi chappathi, drop enough potato masala, roll it tightly,serve immediately. 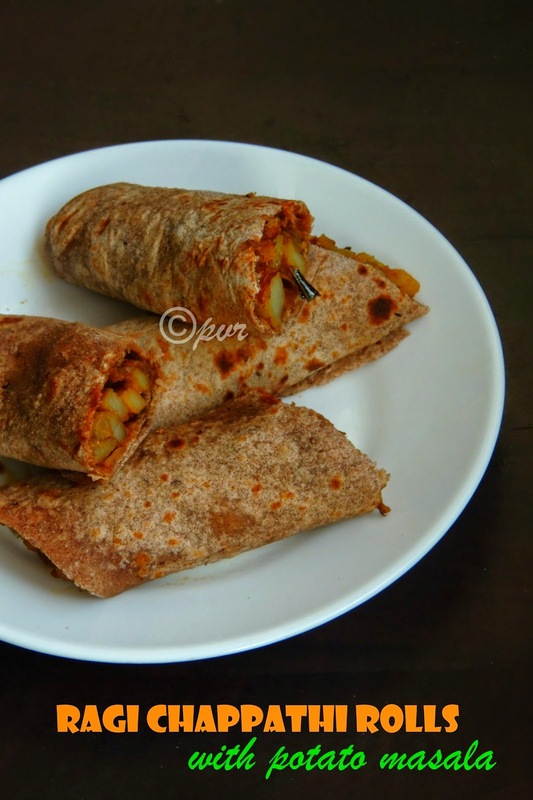 Healthy ragi chapathi rolls. I need nothing more than this it is a filling roll. 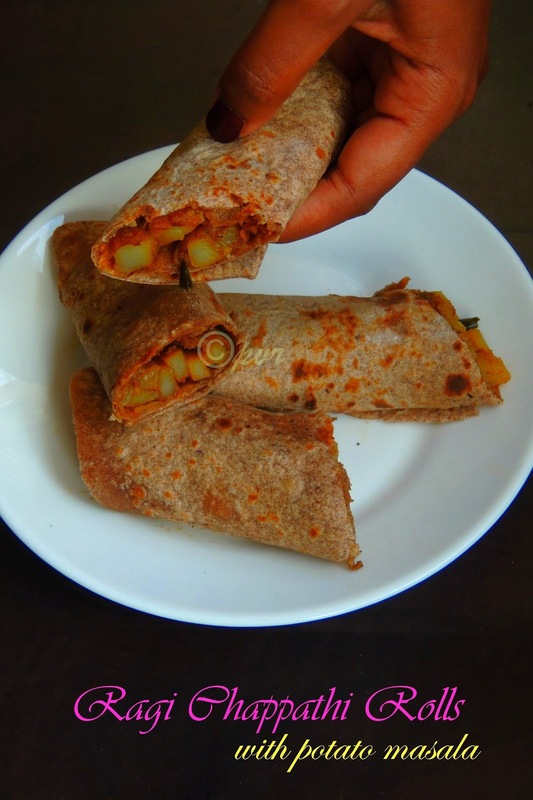 What a healthy chapathi, with that potato filling these rolls are even more delicious! !! Healthy and tasty looking chapathi. Wonderfully prepared. Delicious and healthy looking ragi roti rolls. oh yumm that looks delicious and simple to make!! With a side salad, this would make a great lunch for me. Very delicious and healthy rolls ! Delicious rolls where do u get the ideas from to use ragi. u are awesome Priya. Beautiful clicks and very nice idea.. The rolls look so tempting Priya...healthy one too! Very healthy recipe Priya...Looks yumm! Great to know that you are cooking with millets in paris. Am trying make my wife understand the importance of it but in vain. That is a great idea. Must try it. Scrumptious and delicious! My mother used to make this nutritious rotis. Ragi chapati wrap sounds healthy. I like the potato masala you made for the filling.